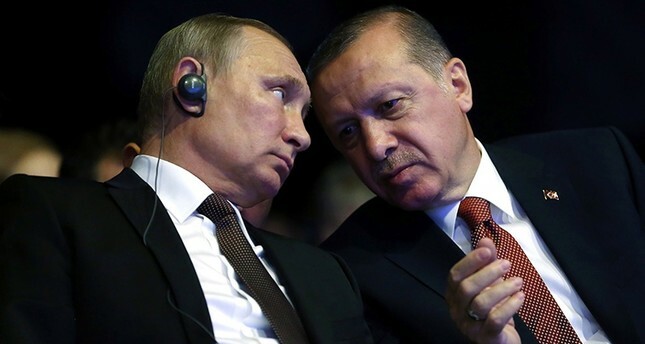 President Recep Tayyip Erdoğan and his Russian counterpart Vladimir Putin are likely to meet next month within the scope of a Turkey-Russia High Level Cooperation Council (HLCC) meeting, claimed a diplomatic source. Despite some tough time between Russia and Turkey last year, their bilateral relations entered a new phase following an Erdoğan-Putin meeting in St. Petersburg on Aug. 9. Sources in diplomatic circles told Daily Sabah that ahead of the next month's HLCC meeting, three fundamental issues were on Turkey's agenda with the Joint Economic Commission, which was initially convened in Istanbul last October, being the most important. The second matter on the agenda was the Strategic Planning Group, which convened on Dec. 1 in Turkey's Alanya province with the attendance of Russian Foreign Minister Sergey Lavrov. The third and final issue on the Turkish agenda, according to sources, was the Civic Forum, which has subcommittees, such as the Historical Committee Chaired by prominent Turkish historian İlber Ortaylı. The source said the goal of the Civic Forum sub-committees was to establish relations in the economic field and not leave relations in the political field only while establishing solid relations. Another part of these goals includes academic cooperation between the two countries, as a meeting was expected to be held prior to the upcoming HLCC meeting. In regards to the existing Russian sanctions, Daily Sabah's diplomatic sources added that the sanctions were gradually being lifted, as they had affirmed that remaining sanctions are there due to sanitary restrictions that are currently being discussed between the two countries. While economic trade relations remain strong between Turkey and Russia, sanctions on over 80 companies have been lifted, said the sources. Meanwhile, visa-free travel to Russia from Turkey was also on the agenda, as the sources said, "Visa liberalization between Turkey and Russia was our expectation; however, the Russian side has some security concerns. Nevertheless, we believe visa-free travel for businessmen and official delegations are on both countries priority list." Touching upon bilateral relations, especially in trade and economy, the diplomatic sources claimed that Turkey was adamant to restore relations with Russia to the pre-crisis level and even enhance it. However, the source, speaking on condition of anonymity, also underlined that enhancing Turkey's relations with Russia was not an alternative to its relations with the West. Noting that Turkey expects Russia to lift visa applications for Turkish citizens, a Turkish official from the Foreign Ministry said: "Russia is currently conducting a project. I suppose they have thoughts about lifting the visas primarily for businessmen and official delegations." Commenting on Turkish-Russian relations, the official said that a Turkey-Russia High Level Cooperation Council (HLCC) meeting was planned earlier this year. Among the three main mechanisms under the HLCC meeting, the Joint Economic Commission (JEC) and the Joint Strategic Planning Group (JSPG), meetings were initially held, stressing that the Turkish-Russian Social Forum, the third step of this mechanism, aims to continue relations by forming a solid basis from society to society alongside the political field. Suggesting that Prime Minister Binali Yıldırım's visit to Russia accompanied by seven ministers is an important step in getting bilateral relations closer, returning to its former close relations, and even moving relations further than before, the official stressed that the assassination of Russian Ambassador to Ankara Andrey Karlov, in an armed attack, was aimed at sabotaging the course of Turkey-Russia relations. With regards to the current stage of bilateral relations, the foreign affairs official said that their current perspective in the new year is for the HLCC meeting to be crowned with concrete results. The official added that the Russian delegation, which came to Turkey in the aftermath of the assassination of Russian Ambassador Karlov to carry out the investigation process with Turkish authorities, continued to work without any problems. Some Russian restrictions placed on Turkey in the period when relations between the two countries were strained, have been lifted and will continue to be lifted, the official said, adding that by issuing a decree, Russia reduced the working quota of migrant workers, most of whom are from Central Asia, to 18 percent. Underlining that this decision is the result of a general trend in the global economy, the official noted that Turkish firms, in particular, want to hire Turkish employees. Recalling that some firms were exempted, the official stated that the number of said firms has expanded, but the rest are subject to visa applications. The official stressed that a majority of these firms consist of contracting firms, which can hire Turkish employees and bring new ones without exceeding a certain quota, indicating that they are not subject to any restrictions and that the foreign ministry is applying for the lifting of restrictions on the others. Restrictions were initially lifted for 30 companies operating in Russia, and now, the number of firms for which restrictions have been removed subsequently reached 50 and 80, the official said, pointing out that the ban on five of 18 agricultural products by Russia was lifted and that an opening could be made in this field. The official noted that restrictions on 13 products, including peppers, pomegranates, zucchini, lettuce, aubergines and tomatoes, are still in progress, but on the other hand, attempts have been made to lift these restrictions. Recalling that both countries talked about trade in local currency, the official said that both sides were determined on this issue. Indicating that TurkStream Natural Gas Pipeline Project is a two-stage project, the official said that one line of TurkStream is aimed at replacing gas that Turkey receives from Ukraine, Romania and Bulgaria, and a second line is planned to send gas to Europe. The official said that the construction of this line depends on a decision to be taken between Russia and the European Union, adding that if gas demand comes from Europe, this line is economically feasible.